**Immediate Occupancy for this Stunning 3BR, 3.5BA, Windowed EIK and laundry Room surrounded by the BEST VIEWS! floor to ceiling windows in every room!A smoked walnut entry door and a white oak foyer welcome you to this luxurious residence featuring three bedrooms, three baths and a powder room. Designed by SHoP Architects, this 2,417 SF home features white oak floors and floor-to-ceiling windows offering dramatic city and river views from three exposures. 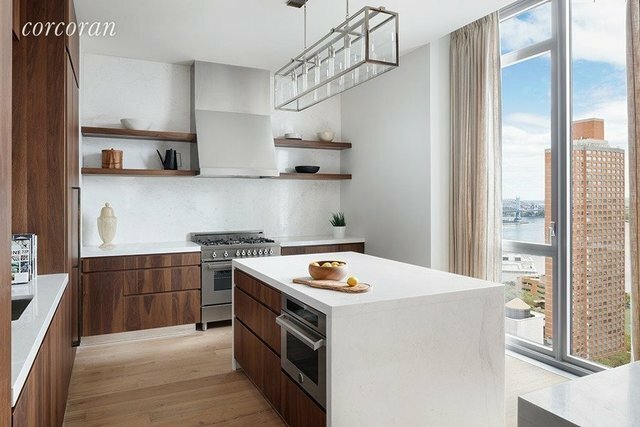 The windowed, custom chef's kitchen designed by Clodagh for Citizen360 features smoked walnut cabinetry, Persian White Pulido Porcelanosa slab countertops and backsplash and an island with a waterfall edge. Appliances include a stainless steel Bertazzoni range, a Sub-Zero refrigerator, a U-Line wine refrigerator and a Bosch dishwasher. The unique powder room features Baltimore limestone tile flooring and walls with Sense by Clodagh 27 fixtures. Baetig Azul limestone flooring and Saint Louis limestone walls with a custom stone and teak vanity offer spa-like tranquility in the five-fixture, master bathroom. Recessed medicine cabinets, double sinks, Zuma soaking tub and glass-enclosed shower with Sense by Clodagh 27 fixtures complete this serene retreat. The three-fixture, en-suite secondary and third baths feature Yakarta Blanco Porcelanosa tile, custom wood vanity with stone countertop with Sense by Clodgh 27 fixtures. Additional features include: washer/dryer with spacious laundry room and sink, year-round zoned temperature control via central heating and cooling system. Amenities include a 24 hour attended lobby, a fitness center, a residents' lounge, a music room, a screening room, a playroom, and bicycle storage. Automated parking and additional storage units are available for purchase with this residence.The complete offering terms are in an offering plan available from Sponsor. File No. CD14-0358. Sponsor: 1711 LLC., 11 East 26th Street, Suite 1300, New York, New York 10010. Any attached artist's or architectural renderings, sketches, graphic materials and photos, and are proposed or conceptual only, and are based upon preliminary development plans which are subject to change. Any views shown are photographs taken from a drone taken prior to construction. No representation is being made as to the precise views given the vantage points are not from a specific unit.